I got to be honest, I only got about an hour of sleep last night. I did get a healthy four hour nap early yesterday, but last night was not a great night for sleeping for me. I have been doing a lot of hard thinking and on top of that I was watching the Olympics. I did some serious thought about selling my mopeds. I know, I know... they are my hobby and such a huge part of my free time. I would need to invent a hobby as enjoyable as mopeds, but I can't. I have some things coming up soon and if I didn't have the mopeds it would be a little easier. I also was up keeping one eye on the Olympics until my wife yelled at me for being awake and addicted to watching the games. I finally fell asleep a little after 11PM and then was woken up to thunder just shortly after midnight. After checking the radar and seeing the storms strengthening, I got dressed and came into work to take the baton from Chris Mulcahy so he could get some rest. He moved into a new apartment earlier so he was super tired. 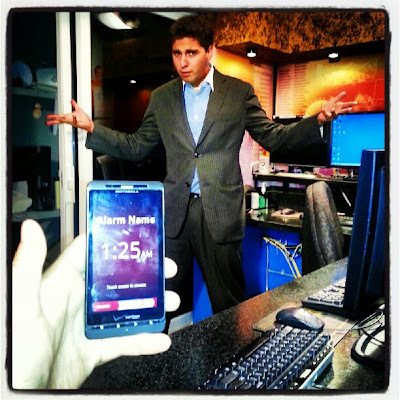 While we tracked the storms, my phone went off with the alarm to wake up and get ready for work... already there. The storms overnight did have strong winds and hail with them and more storms like that will be expected for today. I am having a hard time agreeing with Futurecast today. It brings showers and storms through this morning and I agree with that, but not in the afternoon. It turns off the rain maker and dries us out for the afternoon. I do not agree with that and neither do the other forecast models or the Storm Prediction Center with the National Weather Service. The cold front has pushed to the south, but it will lift back north today with warmer air and that will trigger afternoon showers and storms, especially for the Northern half of Ohio. There is a slight chance for storms with tornadoes across the north... the SPC has a 2% chance for a tornado within a 25 mile radius for anywhere north of I-70 for Ohio. All of the Ohio Valley has a chance to see storms with strong damaging winds and hail. The best timing for these storms will be the afternoon into the evening hours, so make sure to stay alert for any warnings issued. There is one HUGE way this could change. The morning showers and storms will pull energy out of the atmosphere and the cloud cover will keep us from warming up very fast. This will limit our chance for severe weather. Overnight I expect more storms with heavy rain at times. The forecast models are showing close to an inch of rain if not a little more in localized locations so we could put a pretty big dent in our rainfall deficit for the year with is near eight inches below normal. Showers and storms early tomorrow then slowly clearing up through the day. Still could see a lingering shower heading into Saturday but the chances for that are slim. Highs will go from 86 today to 73 tomorrow then upper 70's for the weekend. Low 80's for highs next week with another chance for rain Tuesday. Stay alert for severe weather later and have a good one! Here is a weird one... cataracts reversed? !